Seriously, don’t you wish you had a dollar for every chicken recipe you’ve ever searched for? Add a dollar for every chicken recipe you’ve ever made and you could have your own island in the pacific. 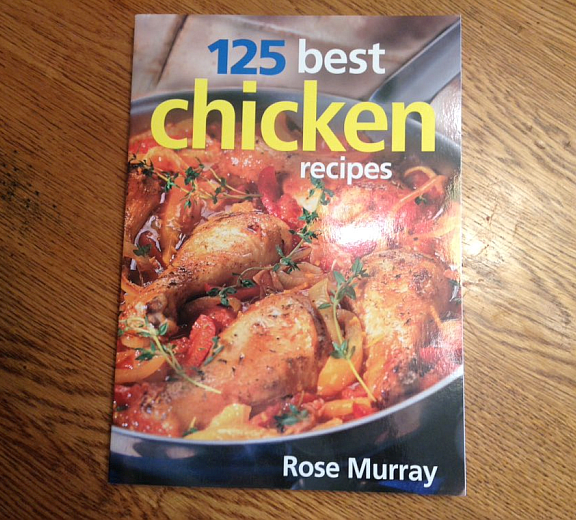 I was sent a great cookbook to review, 125 Best Chicken Recipes, and it provides over 100 great chicken recipes all in one place (125, to be exact). My searching days are over! As is the case with most cookbooks, the number (125) can be kind of an understatement because after you’ve added your own personal spin to the already great recipes, you’ll end up with countless versions. For example, the Hoisin Orange Chicken on page 126. You could (and should!) make it just as it’s written but you could also, on some occasions, go with lemon zest in place of orange zest and add cilantro in place of minced ginger root – changing the flavor for variety. You may grill it one time and make it on the stove stop, the next. There are endless possibilities with each great recipe. I also love that each comes with a “Suggested Menu.” Let’s face it, sometimes we very much want someone else to do all the brain work for us. I call these Mondays. Back in print, this bestselling book on chicken illustrates just how versatile chicken can be. In today’s busy households, chicken has become a standard meal for people who want good and healthy food in a hurry. With 125 Best Chicken Recipes, there are dozens of different ways to prepare delicious and inspired chicken dishes — all in record time. Chicken and Summer Fruit Kabobs. Find 125 Best Chicken Recipes on Amazon. If you love chicken, this is a cookbook you’ll definitely want in your collection. When it comes to food preferences, one of my strongest has to do with chicken. To me, dark meat has tons more flavor than white meat. I’ve even heard a few chefs on tv say the same thing. Each time they do, I give them a mental high five. Yes, experts say white meat is healthier. Yes, many people swear by white meat. 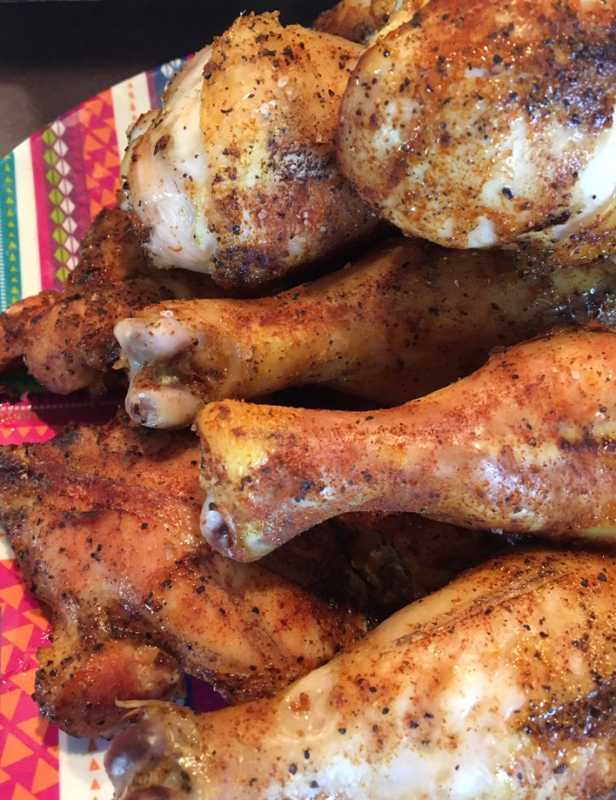 But, it is what it is and, as far as I’m concerned, chicken thighs and legs are where it is. 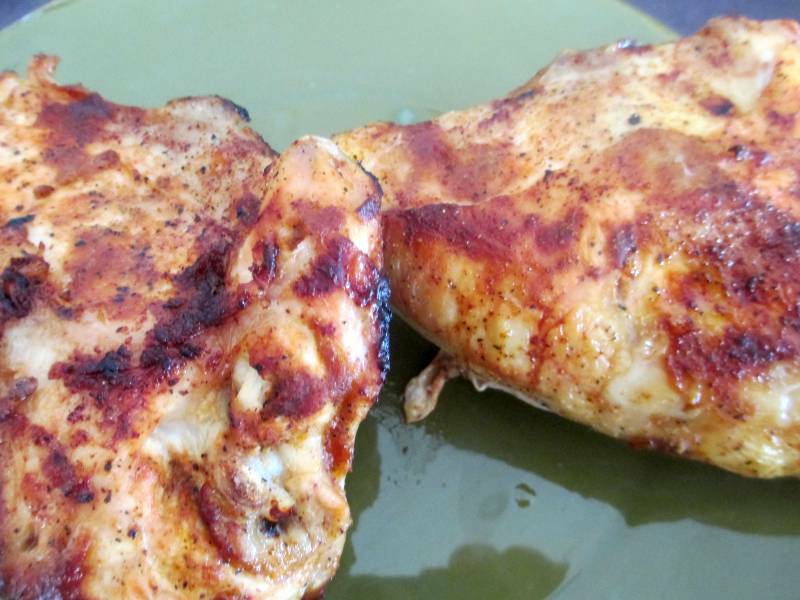 You could use this baked chicken recipe for breasts, of course. Whatever floats your boat! You can also use your herb of choice – I love rosemary with chicken, but feel free to use basil or thyme. 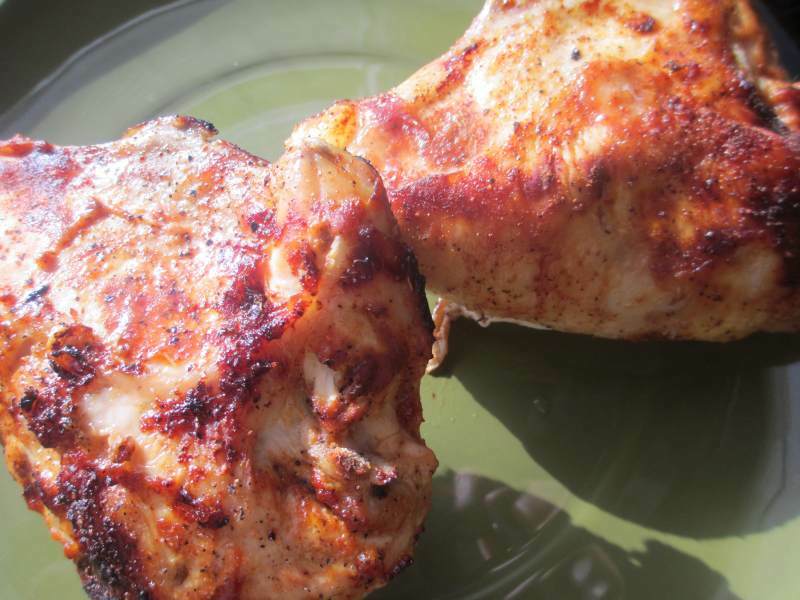 Lightly rub both sides of chicken thighs with oil. Season both sides of each chicken thigh with parsley, seasoned salt, garlic powder, black pepper, and rosemary. My husband ran to the store and grabbed us some baking potatoes and asparagus to go with supper – I had to take a picture of the huge potatoes he found. When your potato is even bigger than your chicken thigh, you sent the right person to shop for your potatoes! 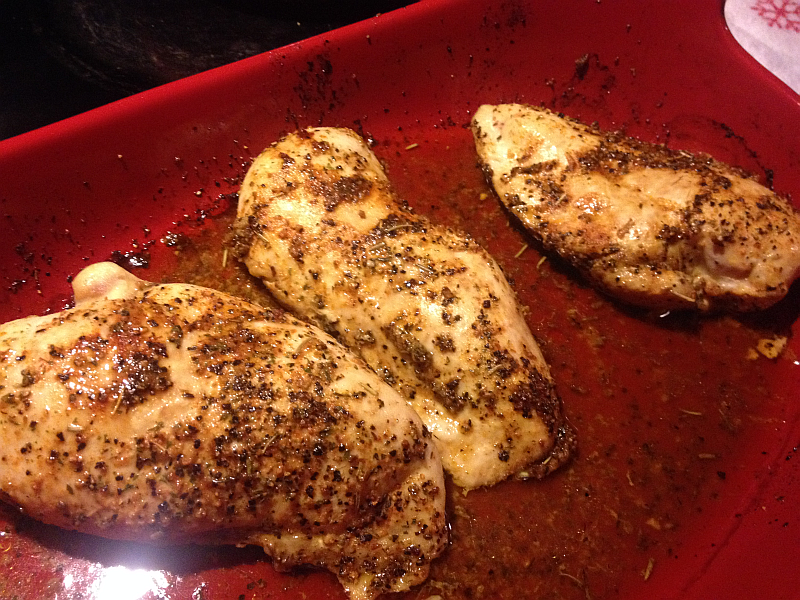 As a matter of fact… yes… the baked chicken above was even more delicious than it looks! I knew that French’s (makers of the mustard and Crispy Fried Onions we all swear by!) would be launching these new products in April, so I held on to them for a while – planning to use them when we whipped out the grill when the weather warmed up. I figured that the products coming out right at grilling season would be a perfect fit for a post featuring grilled meat. Needless to say, I didn’t make it. Each time I fixed chicken, beef, or pork, I’d pick up one of the infuser bottles and flirt with the idea of going ahead and trying it out. New food products and kitchen gadgets are toys in the playground I call a kitchen and me… well, I’m just a little girl who forgot to grow up. I always figured it wasn’t quite what it was cracked up to be. Suffice to say, they didn’t stay in the Spice Cabinet long. The first to disappear was the Teriyaki Flavor Infuser. I used it to add an uncommon amount of flavor and unexpected sassiness to baked ribs. I HATE that I forgot to take pictures of the ribs before they disappeared. They were juicy, flavorful, and amazingly delicious. I did, however, learn my lesson when I used the second Flavor Infuser to disappear – The Classic Steakhouse. I took several pictures before they disappeared! Although I had huge plans for using it on the first grilled steaks of the grilling season, the temptation was just too much for me. 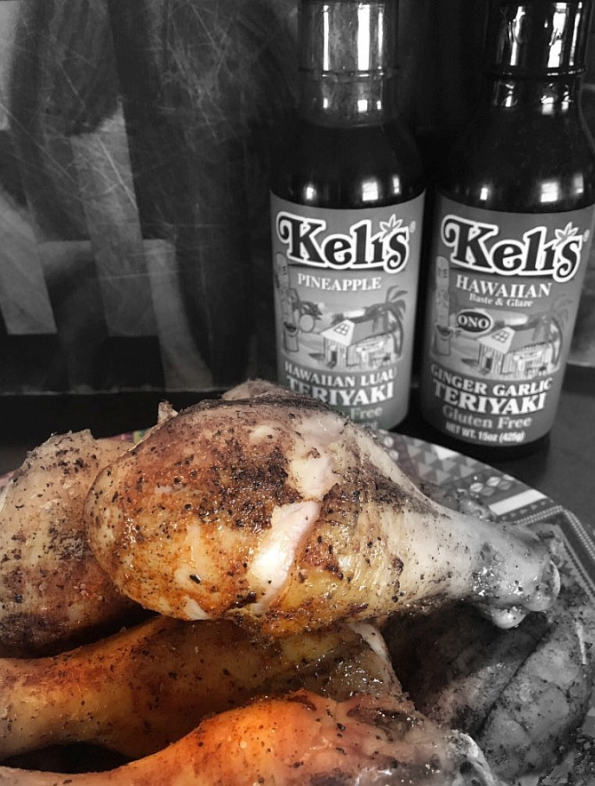 One evening, as I was getting ready to bake chicken for supper, I found myself deciding on a marinade. 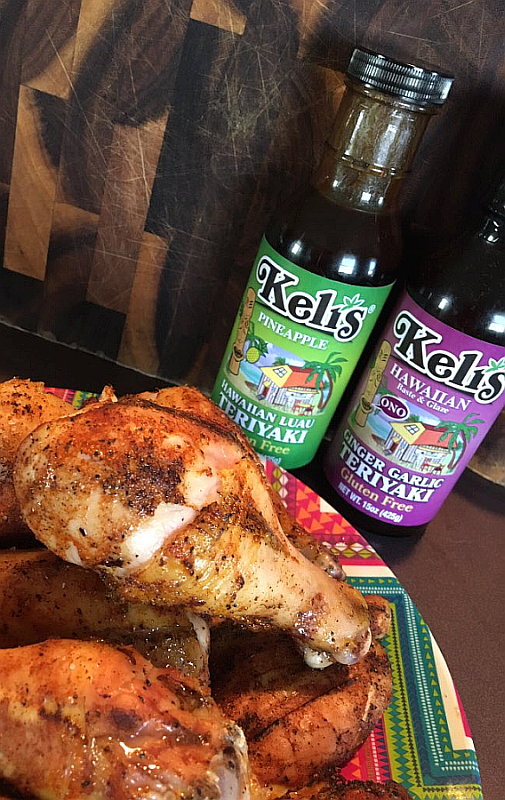 Why even bake chicken if you don’t marinade it for an hour or two, right? When I went to the cabinet to begin retrieving ingredients for a marinade concoction I saw the French’s Classic Steakhouse Flavor Infuser sitting there looking all enticing. I tried to tell it about my grilled steak plans… but, as the words were coming out of my mouth, my hand was reaching for the bottle. If the chicken hadn’t been so uncommonly delicious (best baked chicken I’ve ever had), I’d feel a little remorseful. But, as it is, I just feel peachy. The French’s Flavor Infusers are a cinch to use. You simply open the bottle and insert the tip into your meat – then you squeeze the desired amount of magical goodness right into the meat. Not over the top, where you watch helplessly as it pours down the sides and runs all over the dish. The French’s Flavor Infuser tip gets to the heart of the matter and you LITERALLY taste the difference with each bite. I’ll be buying these up by armfuls as soon as I see them in my local store. My mouth is watering thinking of ways to use them with the grill – hamburgers, steaks, chicken, pork, hot dogs… I also can’t wait to experiment with them with Boca Burgers and Black Bean Burgers. The possibilities are as endless as they are delicious. Preheat oven to 400 degrees F. Rinse chicken pieces in water and pat them dry with paper towels – then toss the paper towels. Infuse some of the Classic Steakhouse Flavor Infuser (or any flavor you choose) into each piece of chicken. A little will run out, which is perfectly fine. Infuse the flavor into several different parts of each piece of meat. Spray the bottom of a roasting pan with Olive Oil Spray (or use Olive Oil straight from a bottle – just be sure to coat the entire pan lightly). Arrange the pieces skin-side up in the roasting pan, being careful not to over-crowd the pieces. Salt and pepper the pieces of chicken at this point. Be sure to get the bottom sides as well as the top sides. Cook for 30 minutes at 400 degrees, then lower the temp to 350 degrees and cook for 10-30 minutes more (about 14 to 15 minutes per pound total cooking time) until juices run clear (as opposed to pink) when you gently poke the chicken with a sharp knife – or the internal temperature of the chicken breasts is 165 degrees F and the thighs are 170 degrees F.
This last part can be a little risky, but I like the effect. During the last 5 minutes of cooking, you can turn put your chicken under the broiler. Don’t even think of walking away, though, or your entire meal will be a hot mess. Putting it under the broiler for the last 3-5 minutes gives it a cool brown color on top that reminds me of grilled chicken. You just have to be very careful not to overdo it – dried, overly browned chicken is darn near sinful. 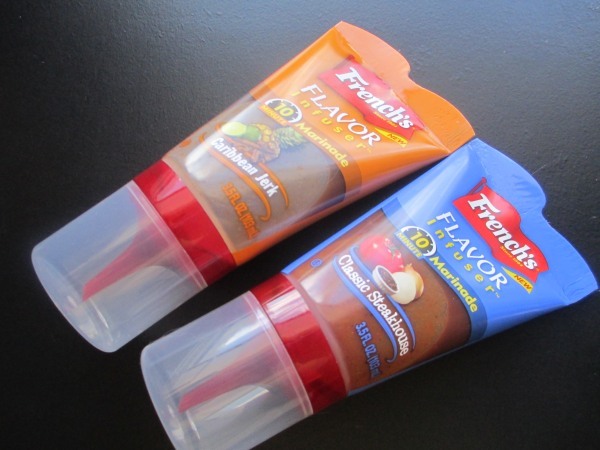 Click the links at the top of the post to find French’s Flavor Infusers on Amazon. Be sure to check your grocery store as well, they may be there on the shelf – just waiting to rock your culinary world. These, honestly, are amazing. As a Giada De Laurentiis fan, I’m excited to tell you that she has a new cookbook on the market, Weeknights with Giada (click the link for more information or to order your copy from Target.com today!). Below is a great recipe from the cookbook. Like ALL Giada De Laurentiis recipes, this one’s a winner. Heat the same pan used for the chicken over medium-high heat. Add the onion and season with 1 teaspoon salt and 1/2 teaspoon pepper. Cook, stirring frequently, for 4 minutes, until softened. Add the garlic and cook for 30 seconds, until aromatic. Add 2 cups of the chicken broth and 1/2 cup of the tarragon. Bring the mixture to a boil. Reduce the heat, cover the pan, and simmer for 30 minutes, until the chicken is cooked through. Remove the chicken pieces to a platter and tent with foil to keep warm. 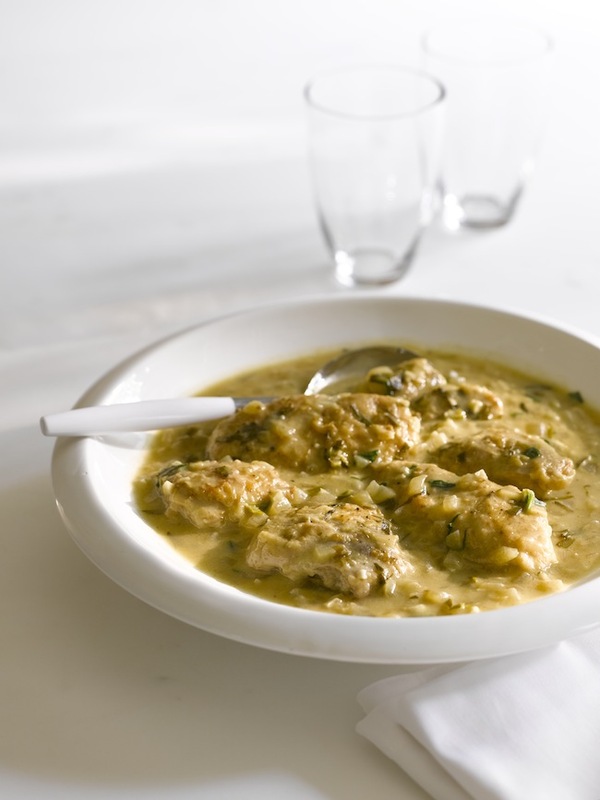 In a small bowl, whisk together the remaining 1/2 cup chicken broth and the remaining 2 tablespoons flour until smooth. Whisk the flour mixture into the simmering cooking juices. Whisk in the mustard. Bring the mixture to a boil and cook for 5 minutes. Remove from the heat and stir in the butter until smooth. Season to taste with salt and pepper. For an interview with loveliness personified (aka Giada) on A Bullseye View, click here! It seems like most budget-friendly recipes and meals involve ground beef, don’t they? I love when chicken recipes play by the penny-pinching rules. This casserole is also a quick and easy recipe, so basically there’s nothing you won’t love about this Chicken Broccoli Casserole! Cook chicken thoroughly and discard all bones (be sure to get them all!). Cut chicken into bite-size pieces and place in a baking dish. Cook broccoli in salted water and drain well. Place broccoli on top of chicken. Melt margarine in saucepan over medium heat. Blend in flour. Add cheese and broth and cook until thickened. Add whipping cream, stir until smooth. Pour the creamy mixture over the chicken and broccoli. Cover with bread crumbs and bake for 25 minutes at 350 degrees. I cook chicken fairly often. It’s a favorite of two of my daughters (the vegetarian has little use for it) and my husband and I like chicken just about any way it’s fixed. I’ve found that cooking chicken on a George Foreman Grill is about as effortless and healthy as it gets. Best of all, the chicken is juicy and perfectly cooked each and every time. You can, of course, change the flavor of the chicken (and even its nationality) with different marinades, seasonings, cheeses, and toppings. During the summer, when our garden is getting its splendor on, I use tomatoes, peppers, fresh herbs, and onions on a daily basis. When it comes to Chicken Night, this kicks things up to a whole new level. There are endless ideas for cooking chicken if you experiment with ingredients. Combine the dry ingredients. Of course, you can add other seasonings if you desire – thyme, rosemary, parsley… Whenever I’m cooking, I usually have two or three (sometimes even one) primary flavor that I want to shine through. In this meal, I focus on the balsamic vinegar and basil – with the mozzarella chiming in. If there’s another herb you’d rather spotlight, go for it! Thyme and rosemary are also wonderful co-stars for chicken and mozzarella. Combine the wet marinade ingredients and 2 TBS of the dry ingredients. You’ll have some left over which you can use again (on chicken, fish, eggs…). Pour the marinade over the chicken, either in a bowl where you’re certain everything’s covered or you can do as I do: Use a large ziploc bag. You’ll want the chicken to marinade for about an hour. Be sure to reposition the pieces several times to make sure everything’s getting a chance to bathe in the flavors. While the chicken’s marinating, make your Bruschetta. Combine all of the Bruschetta ingredients. Fire Up the Grill or the Oven! After the chicken has soaked up all the marinade goodness for at least an hour, it’s time to Get Cooking! Heat your George Foreman Grill (or outdoor grill). Cooking times vary greatly, so keep a close eye on everything. If you’re using a George Foreman Grill (or other indoor grill), check the cooking chart that’s included. For boneless chicken breasts, the time is usually between 11 and 13 minutes. Outdoor, or stovetop grills, usually take about 7 minutes each side. I use fresh Mozzarella balls when cooking and/or making snacks. The taste is beyond comparison – so fresh and delicious. 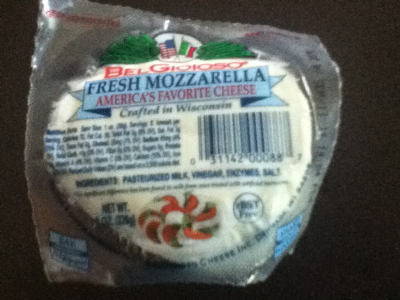 It’s Heavenly sliced on top of pizza in place of Parmesan or shredded mozzarella. Slice the cheese ball and lay slices on top of the chicken. Most cooks say to remove the chicken from the heat, then add the mozzarella cheese, but… ever the odd duck… I put my cheese on the chicken during the last 1/2 or full minute of cooking. I want it to really melt down into the chicken breasts. Optional, but delectable: On a platter, drizzle a little Balsamic Vinegar, then place the chicken breasts on the platter. Top each with a little Bruschetta. As I said before, I really want the Balsamic Vinegar to be front and center, so I even drizzle a little more on top of the whole production before placing it on the table. 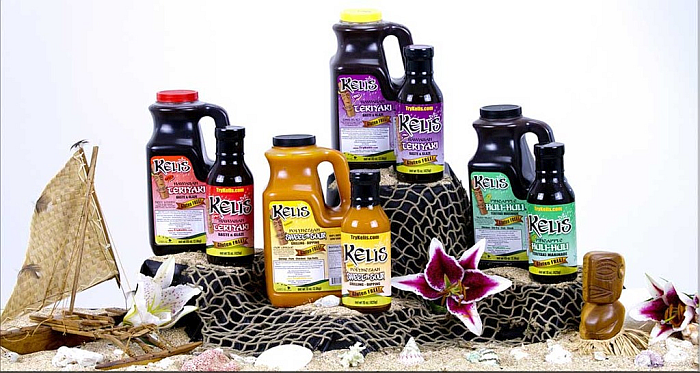 Well, yes, I am obsessed with Balsamic vinegar, how could you tell? 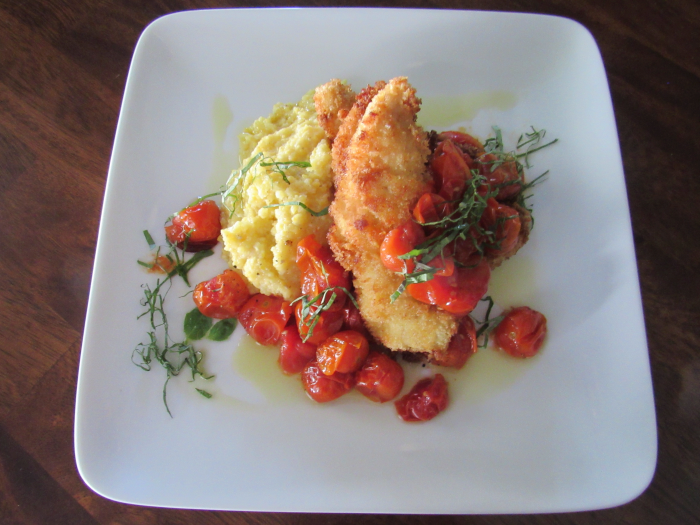 How About Pico de Gallo Chicken? I coat the chicken breasts with olive oil, then season them with salt, pepper, onion powder, and garlic powder before grilling. During the last minute of cooking, I place thinly sliced provolone or Monterrey Jack cheese on each breast. 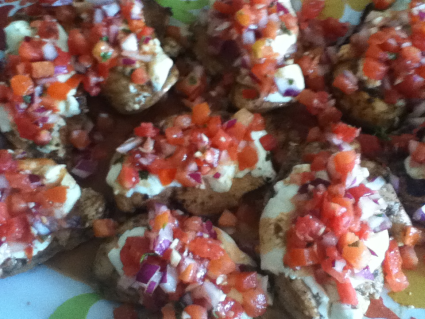 I re-work the Bruschetta mixture by substituting cilantro for the basil. I either use a sweet onion or a red onion, whichever one I have on hand. I also add a little lime juice to the Pico de Gallo mixture. Needless to say, the Balsamic vinegar stays in the pantry when I’m making Pico de Gallo Chicken. Want to cheat BIG TIME?! Simply grill the chicken as directed, add the cheese of your choice, and top each chicken breast with store-bought picante sauce. Pace is excellent! Vegetarians: Use Imitation”Chicken Patties” to make delicious recipes like the ones above. Don’t marinade, however, it’ll only break your heart. Grill your chicken-friendly patties, then top with cheese and the tomato mixture of your choice. I’m adding a new category to the food blog called Eating on a Shoestring. The economy pretty much insists that we cut back a little in different areas of our life, but culinary compromises usually aren’t very appetizing. Or healthy. I was inspired to create this category and try to focus a lot on economical meals and dining by a great cookbook I was sent to review, Eating Well on a Budget (click the link for my review). Since this great cookbook inspired the category, I thought it only appropriate to get things rolling with a recipe from its pages. 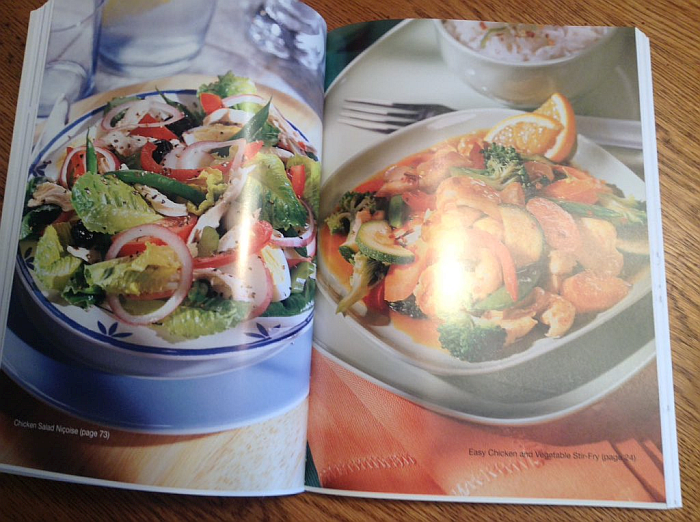 This one’s from page 195 – just one of the many, many delicious, nutritious, and budget-friendly recipes in the book. Here it is exactly as it appears in The Complete Idiot’s Guide to Eating Well on a Budget by Lucy Beale and Jessica Partridge. Stop throwing away the crumbs at the bottom of a bag of whole-grain chips or crackers. Turn them into a crunchy coating for oven-baked chicken strips. Store crumbs in an airtight container until ready to use so they do not become stale. In a large bowl, crush chips or crackers. In a small bowl, beat egg. Dip each chicken strip into egg and then into chip mixture. Coat each piece well and place on a cookie sheet covered with parchment paper. Bake 15 minutes until crispy. Cool slightly before serving. Variation: Use white fish or salmon in place of the chicken. Different chips and crackers produce amazingly different tastes. Try flavors such as real Cheddar, sea salt, and vinegar coarse stone-ground wheat, or crunchy corn. Tasty Tidbits: Serve chicken fingers with several different sauces to add variety to your meals. Try honey mustard, salsa, or for a buffalo wing flavor, serve with sour cream and hot sauce. Order The Complete Idiot’s Guide to Eating Well on a Budget by Lucy Beale and Jessica Partridge on Amazon.